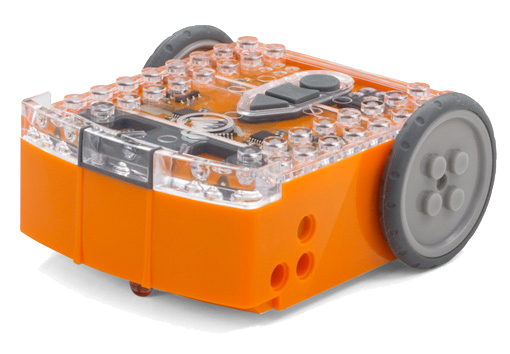 Edison is your programmable robot buddy who will teach you about electronics, programming and robotics in a fun and engaging way. He’s equipped with all the sensors, outputs and motors needed to introduce you to the amazing world of robotics. Let’s get Edison ready to go! To use Edison you’re going to need to know where all his sensors are and what his three buttons do. You may need to come back and have another look as we go through the EdVentures. Before we get into the EdVentures, let’s take a quick tour of EdWare. There are four main types of robot programming icons used in EdWare. These are control icons (red), read icons (blue), data icons (green) and flow icons (yellow). The traditional first program to write is a blink LED program which makes a LED light flash. This is a very simple program and as the name suggests turns on and off the left LED light. There are lots of robot sounds but the most common is a beep. In this EdVenture we add sounds to our Edison programs. Beep!! Beep!! EdVenture 3 – Robots make music too! Edison’s little piezo transducer (speaker) can produce a range of musical notes. These are easily programmed from the play music icon. Get started by creating the program below. Edison has wheels, so let’s us them! EdVenture 5 – What IF? The introduction said that a robot can think or make decisions on its own and act on those decisions. Well, now were going to see how that happens using the IF icon. EdVenture 6 – What’s the hurry? Let’s wait! Edison can wait for more than just time. He can wait for a specific event to occur before progressing through your program. This program takes advantage of Edison’s clap sensor. EdVenture 7 – Watch out! There’s an obstacle! Edison is equipped with an obstacle detector, so he can see obstacles in his path and avoid them. Here’s a simple program that does this. You can control the sensitivity of Edison’s obstacle detection system. By making it more sensitive he can detect obstacles further away, and by making it less sensitive he will only detect very close obstacles. EdVenture 8 – Take control! Use a TV or DVD remote control to control your program and play Star Wars at your command. Edison can respond to a TV/DVD remote control within a program. Here are the barcodes with their ID numbers for use in EdWare. EdVenture 9 – Change is good, let’s get variable! We can use Edison’s light sensors to trigger an alarm. This could be used as a draw alarm. You now have a good understanding of how to program Edison. You can now use this knowledge to create your own programs.